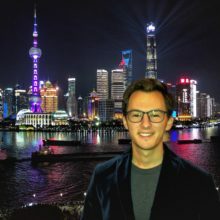 David wrote his major research paper on the nature of transparency in China, considering transparency as a component of governance and a source of political legitimacy at the state’s disposal. He looked into historical precedents for political transparency and accountability in China and offered an evaluation of the effectiveness and limitations of contemporary Chinese open government regulations. What’s David’s advice for prospective and current students? “I would highly recommend prospective U of T graduate students interested in the region to apply to the program, and encourage current program participants to consider working or studying in East or Southeast Asia as a next step.” Students in the Collaborative Specialization in Contemporary East and Southeast Asian Studies can apply for funding such as the Dr. David Chu Scholarships in Asia-Pacific Studies to help cover the costs of travel to Asia for research purposes.